Sharing photos on social media networks comes with a certain amount of risk because there is almost nothing that stops other people from taking your photos and using them as their own. This can be a little disappointing, especially when the huge amount of hard work that went into the production of the professional looking photos is taken into account. Until social media networks come up with a better solution for protecting their users from copyright infringements, adding watermarks to your iPhone photos remains the most reliable way of making sure that nobody is going to steal your property. 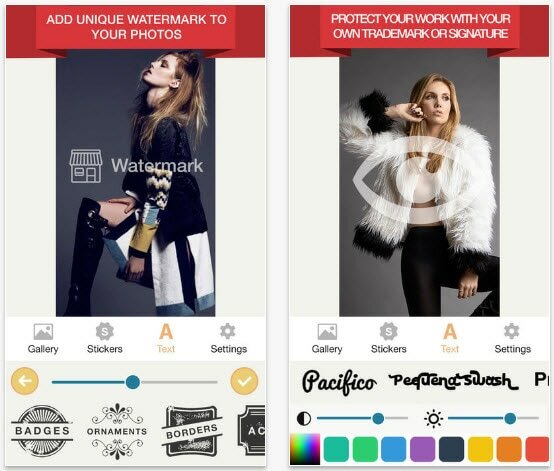 In this article, we are going to take you through some of the best watermark apps available at the App Store. 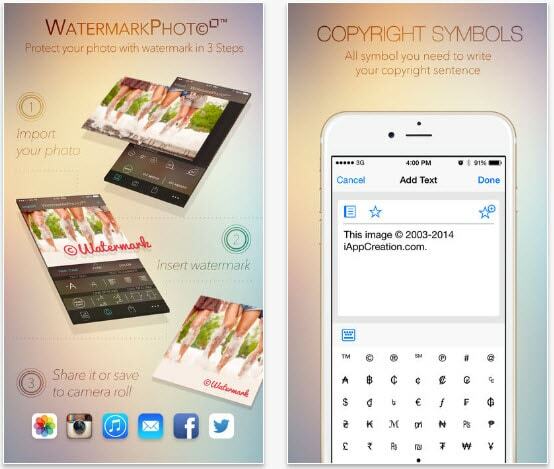 This feature-rich app enables you to import pictures from your camera roll and insert or add watermarks. You can also add a date to your photo or use a preset watermark, while the app also offers over 300 fonts that enable you to create your own unique watermarks. The app's text editing features are remarkable since you can select the size of the font, set the line spacing or fine-tune the text in any other way you want. Watermark Photo Square app, lets you prepare your pictures for Instagram, which means that you can crop your pictures to match the aspect ratio demands of this social media platform. Price: Free for a limited amount of time. There is nothing complicated about using this app since it provides a fast and simple way to add watermarks to your photos. Watermark X features a huge collection of professionally designed template watermarks that can be customized in accordance with your needs. Each user can insert their own information and adjust the position of the watermark on the photo or change its size, opacity, and color. The database of watermark templates is constantly updated so the app also enables iPhone photographers to change the watermark they are using as often as they want. You can add unique signatures, logos and copyright icons to pictures you've taken with your iPhone in just a few simple steps. Watermark Photo contains a huge font library that lets you design your own watermarks, while all the preset watermarks come with a transparent background that makes the job of adding watermarks to photos even easier. The app's sharing capabilities are remarkable since it allows its users to share their images on any social media platform they can think of. This is one of the best watermark apps for iPhones simply because it enables its users to easily annotate each photo and to export the photo without losing the picture quality. The most fun part is that you can use multiple logos and layers of text, which means that you can have complete creative control over each element you add to your photo. 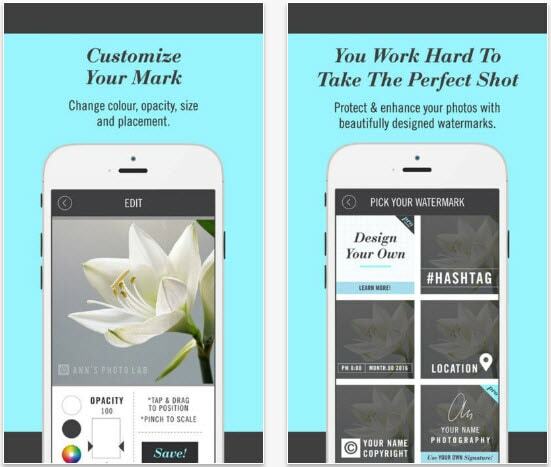 The app also provides powerful tools for editing text and logos. 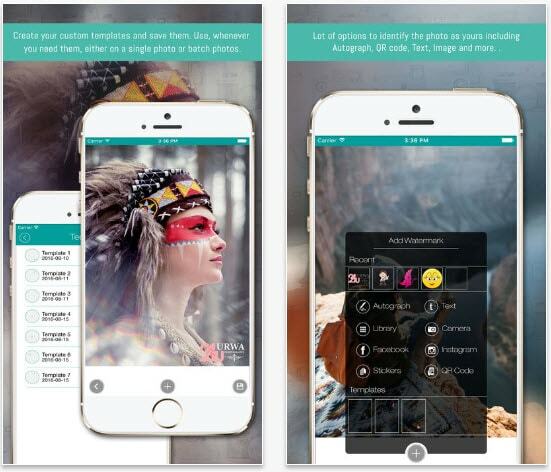 PhotoMarks lets you save watermarked photos to a camera roll or share them on Twitter, Facebook, and Instagram. The process of adding a watermark to a photo with the Impression app is so simple that you don't really have to know how to add watermarks to photos. The app lets you select the font you want to use and you can simply drag the text box to the desired location in the photo. Impression's users can adjust saturation, transparency, hue and brightness sliders to create the watermark they are going to love using. However, the sharing capabilities of this app are limited. More than 2 million downloads this app has, serve as proof that it is widely accepted as one of the best watermark apps for iPhones. Alongside powerful watermark tools, eZy Watermark provides the option to batch watermark over a hundred pictures. The app offers a collection of 150 fonts, while it also enables its users to adjust pen thickness on autographs they add to their photos. The eZy Watermark app lets you import photos from the camera roll, Facebook or Instagram, while it exporting options are no less impressive. Businesses and professionals in need of an app that lets them protect their photos in a variety of ways are going to enjoy using this app. 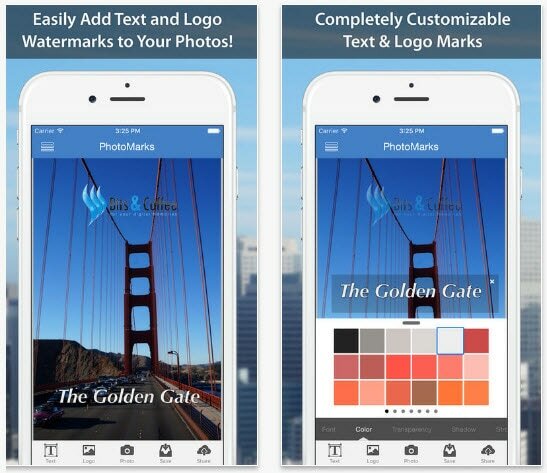 iWatermark lets its users add graphics, signature, text and even QR watermarks to their photos which makes it one of the most versatile watermark apps for iPhones. Over 160 fonts are available, including 34 high-resolution fonts and each font can be adjusted to meet the demands of the picture you want to protect from copyright infringements. 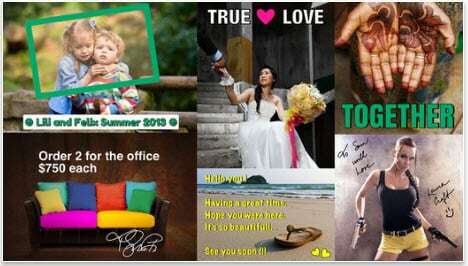 QR codes added to photo with this app, can't contain more than 4000 characters. The A+ Signature app uses one of the best handwritten signature technologies available for iPhones to enable its users to protect their pictures in a stylish way. 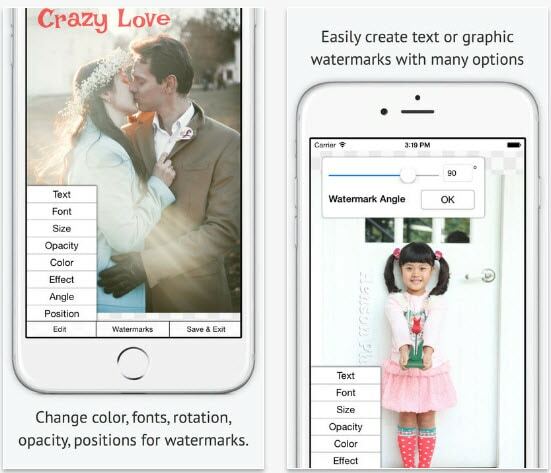 The app lets you use more than one drawing or signature on your photos, while its impressive font library offers countless ways to produce text watermarks. Adjusting size or adding shadows to drawings and texts is easy and the app also lets you rotate the watermarks you add to your pictures. Pasting drawings and text to other iOS apps is also possible. My Watermarks app was developed by Camera 360, one of the best photo app developers in the world today, and its features are nothing short of amazing. 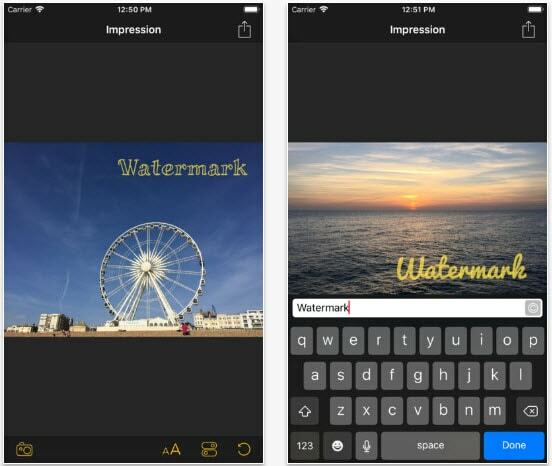 The app is designed to help iPhone photographers create watermarks they are going to love using. Making a logo, taking a photo of your own handwriting and using it as a watermark, are just a few of the amazing features this app offers. My Watermarks keeps track of all logos, signatures, and watermarks, which enables you to quickly access each logo or a watermark you already used.